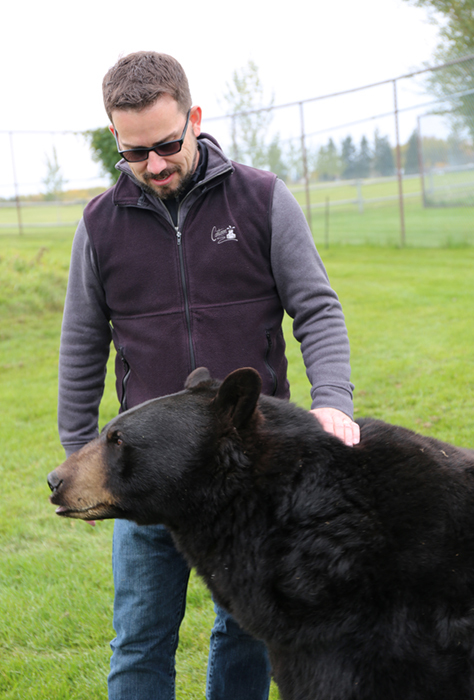 Late last month, Shonna and I drove up to Discovery Wildlife Park in Innisfail for one more regular season visit. With kids back in school, waning light and cooler temperatures, it gets quieter as Thanksgiving approaches, their last weekend before closing until May. They still do their shows as advertised, though. As we were told, everybody paid their admission, so they’re entitled to the same experience whether it’s busy or not. 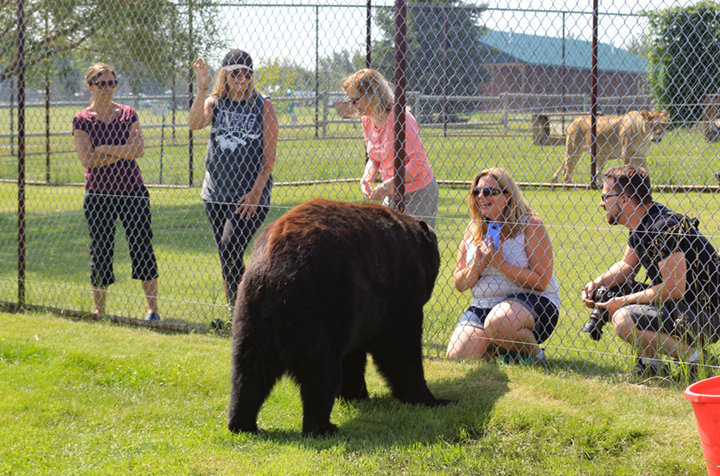 The bear presentation is a bit of a head fake, because even though you get to see the bears show off their training, it’s primarily an opportunity for keepers to educate a captive audience about conservation and safety. 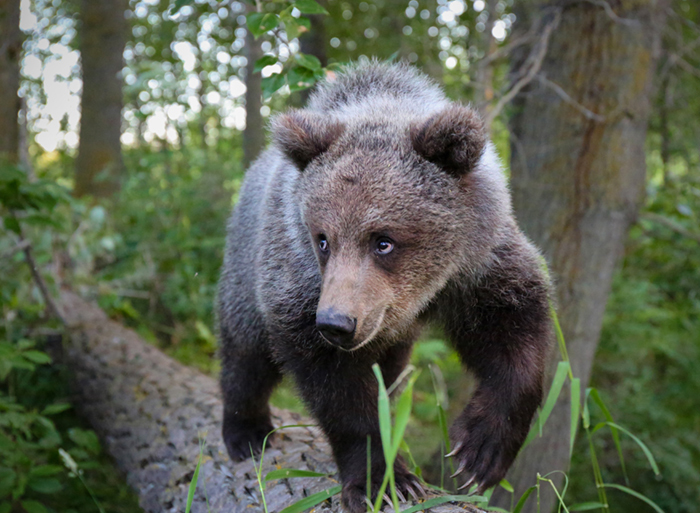 They talk about the differences between black bears and grizzlies and what to do should you encounter either while out in the woods. 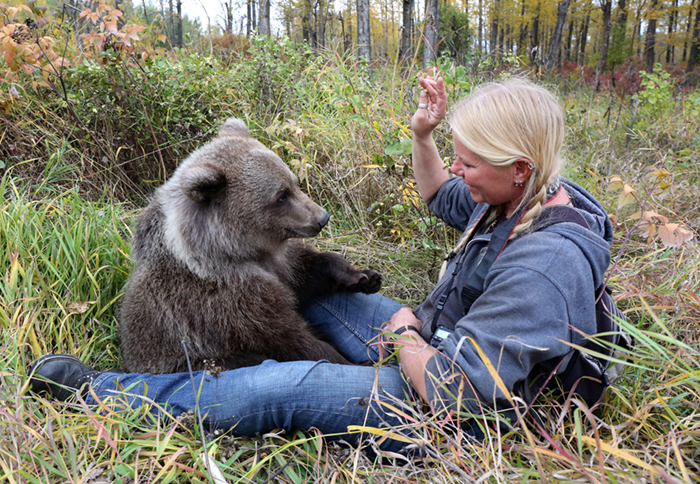 I’ve seen the bear show a few times, but as it was a small group and we’ve gotten to know the keepers, we figured we’d sit in again just to be polite. Of course, the moment you get cocky and think you know a lot, that’s when you learn something new and get taken down a peg. 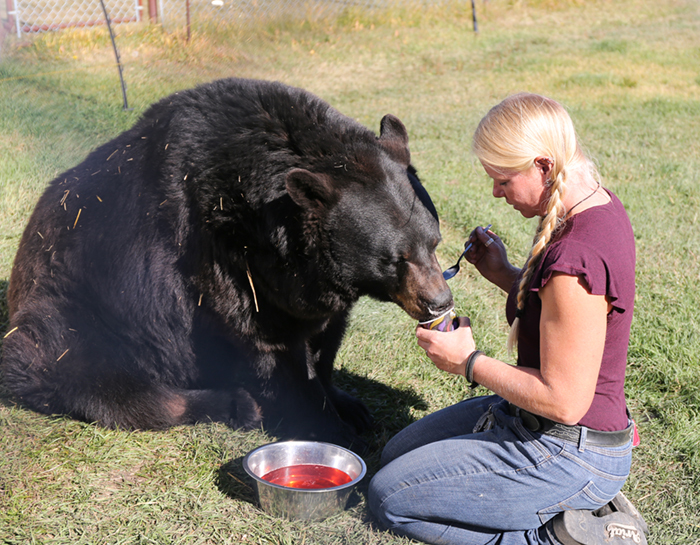 While Serena was talking about Charley and Angel, two of their black bears, she told us about hyperphagia. 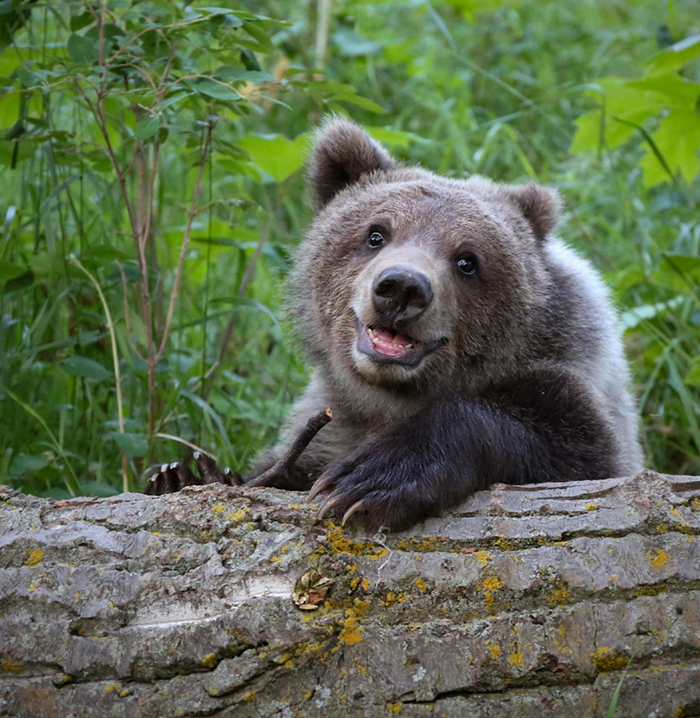 I’m pretty well read, have lived in bear country for more than twenty years, but I honestly can’t recall hearing that word before, or at least not so it registered. 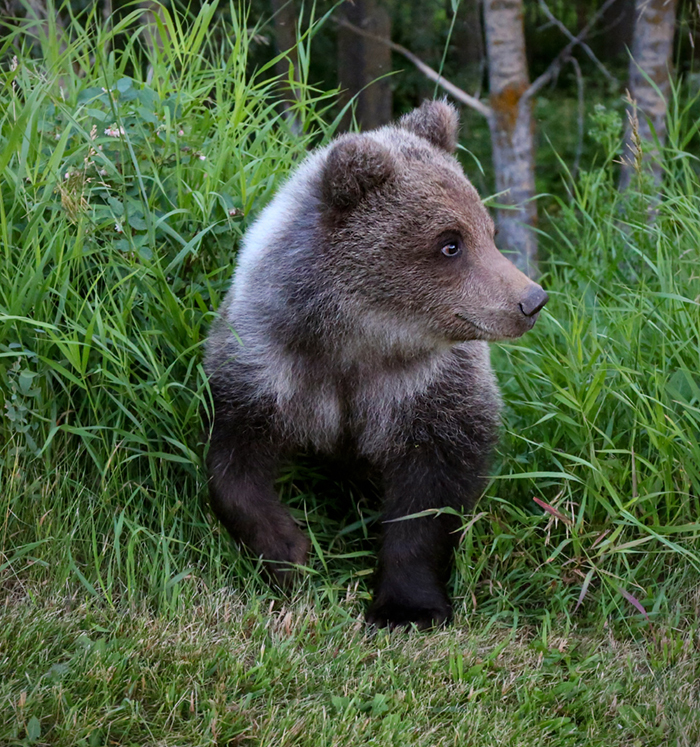 From being bear aware and years of local warnings every fall, I know that bears are eating a lot this time of year to prepare for hibernation, but I had never looked into the science. According to Serena, it’s a chemical process that happens this time of year, making them eat anything and everything they can get. 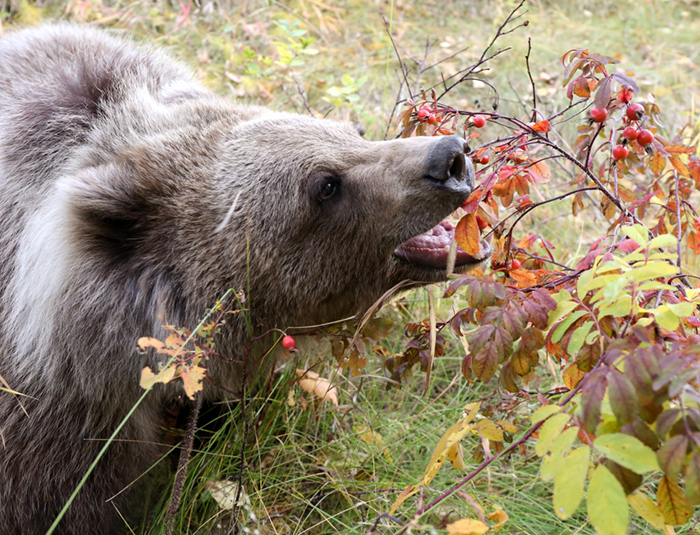 The Park provides plenty of extra healthy food for them during this stage to prepare them for hibernation. On this particular day, we were told that their black bears had just finished this stage and were starting to slow down. 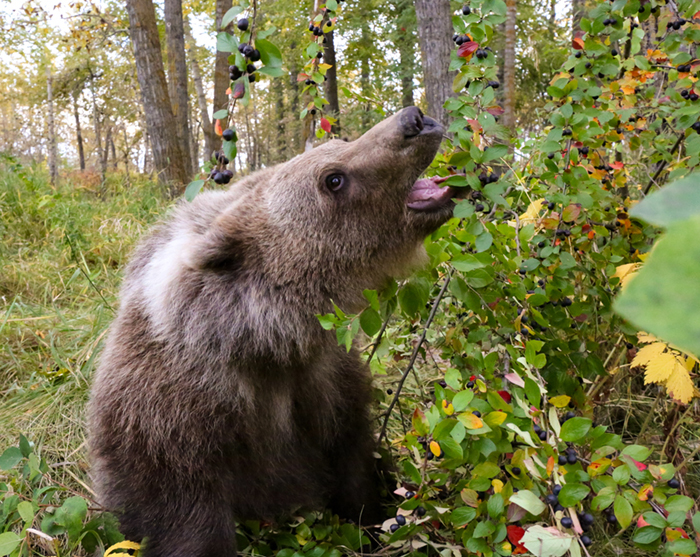 In the wild, it can be a dangerous time of year to run into bears, because they’re so focused on eating and not so much on their surroundings. 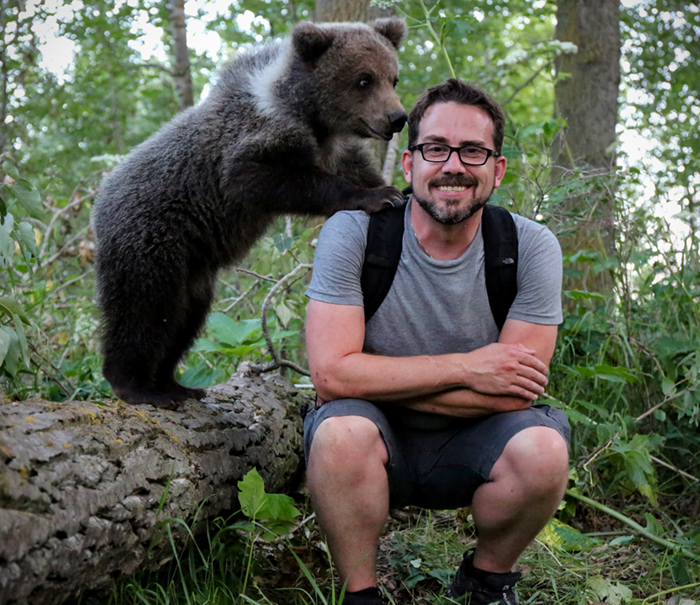 So if hikers aren’t making enough noise, they might surprise a feasting bear, which can have less than desirable consequences. 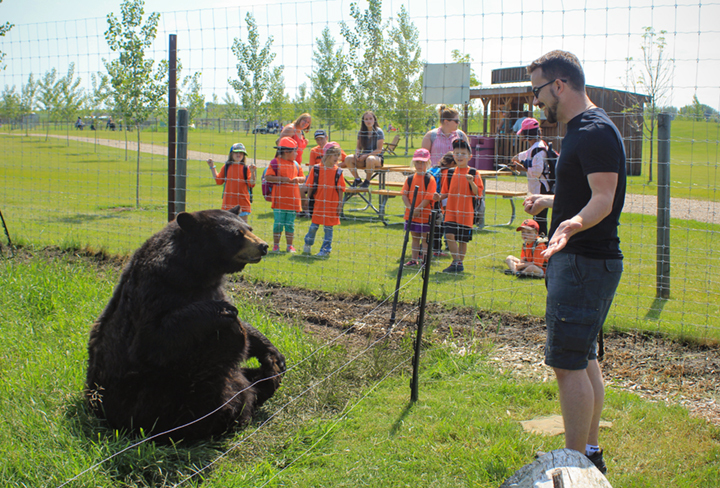 Bears in captivity still hibernate and Discovery Wildlife Park makes them as comfortable as possible in their enclosures while they sleep. Some make use of the large culverts provided, a manmade cave, while others dig their own dens in their enclosures. What many don’t know, however, is that bears still do wake up in the winter. This happens even in the wild, especially on nice sunny days, but they won’t stay up for long. 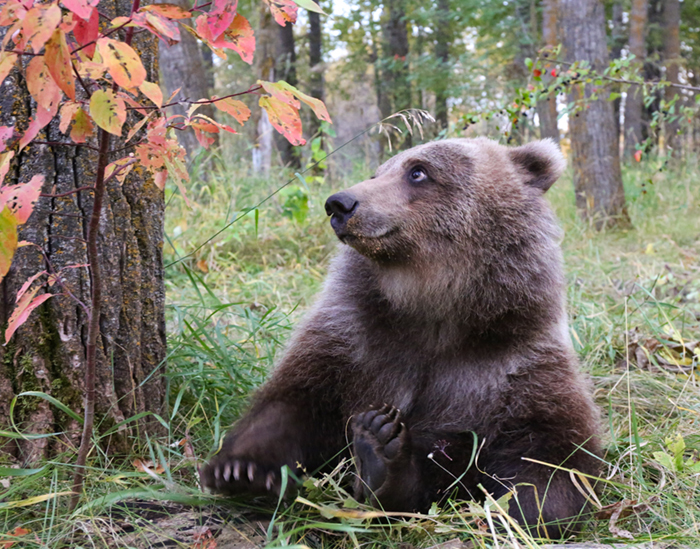 There is one bear, however, who won’t go to ground this winter at Discovery Wildlife Park, and that’s Berkley, their Kodiak Cub. She’s not even a year old yet, has plenty of energy and is still marveling at the world around her. She’s seen snow a few times and appears to enjoy it quite a bit. Serena has said that Berkley likely won’t hibernate for a few years, but she might slow down a little during the winter months. That being said, Berkley still appeared to be under the influence of hyperphagia. Shonna and I had the pleasure of going for a walk with her in the woods that evening. 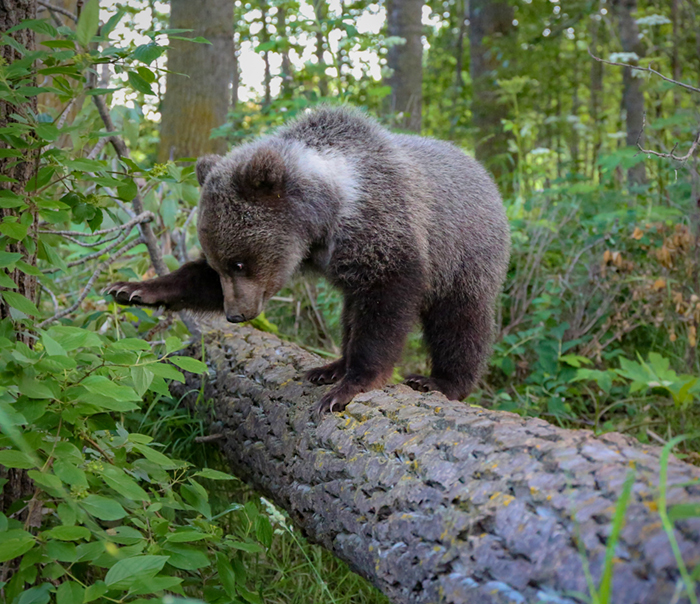 On a previous excursion, Berkley seemed to want nothing more than to explore, climb trees and play. On this visit, however, she just wanted to eat. 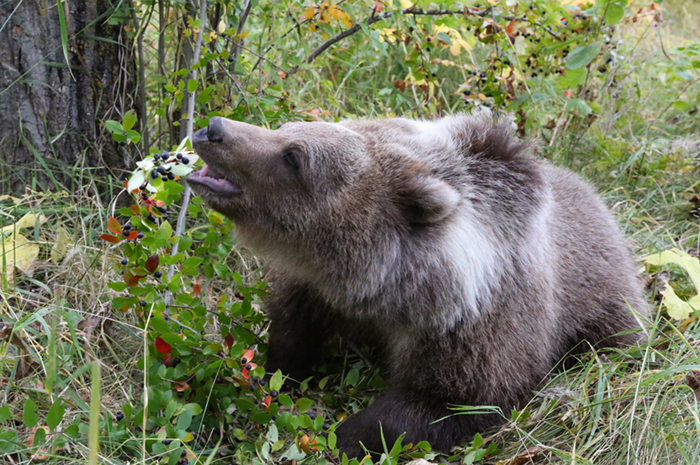 Like a kid in a candy store, she stopped at every berry bush she could find and proceeded to chow down. It was fascinating and fun to watch. Then when she discovered Serena had peanuts, she whined like a little baby until she was given some. 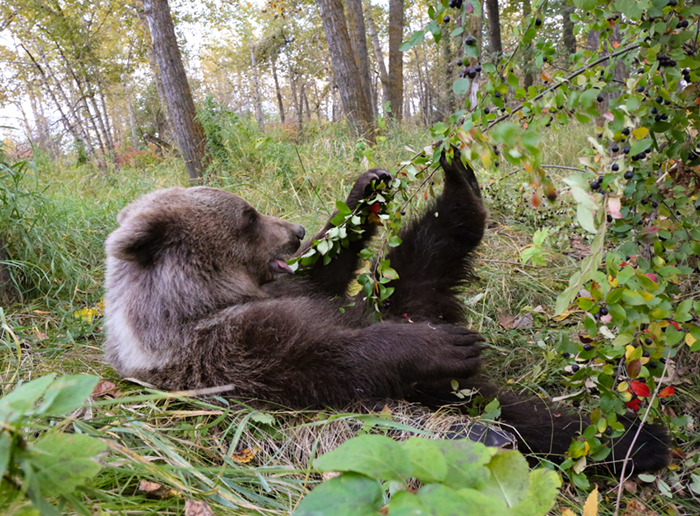 Of course, when they find the treat that each bear likes best, that becomes a golden opportunity to use it for positive reinforcement and enrichment. 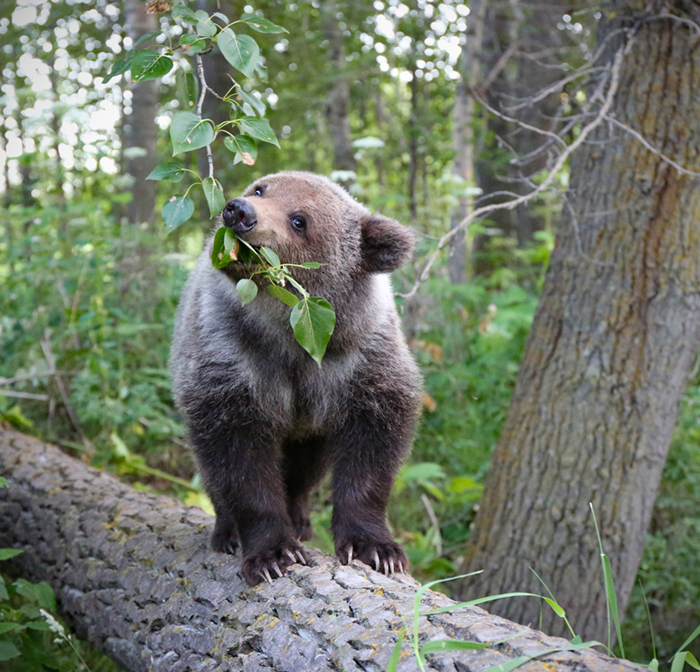 Berkley has proven herself to be a smart bear and learns new behaviours quickly, especially when peanuts are involved. 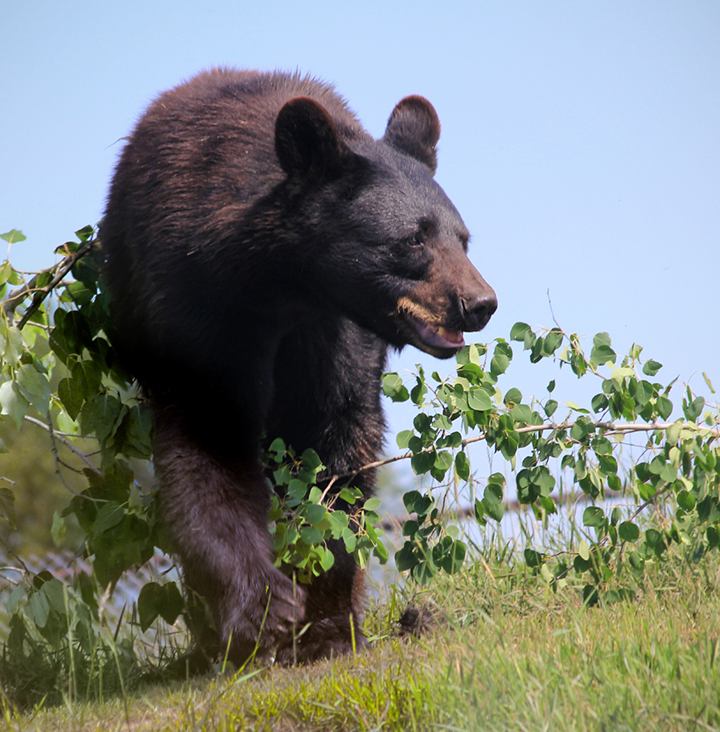 Another black bear at the park named Reno has a thing for guacamole. I met this gentle giant in early 2016 and he’s a wonderful bear. 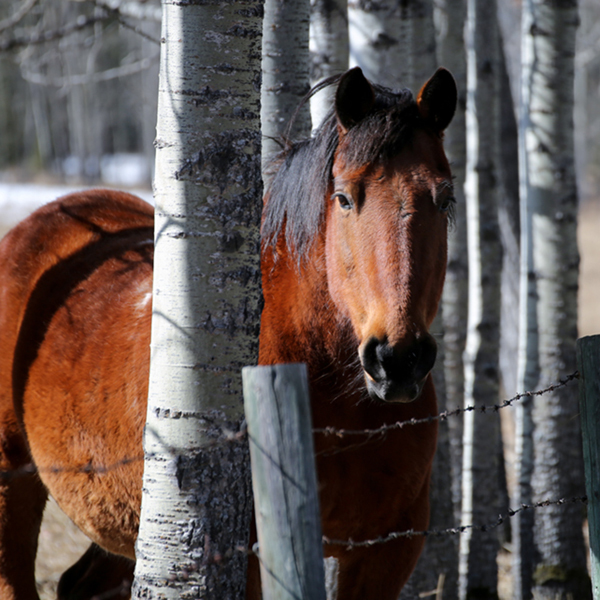 Reno is 22 years old and has been raised at the park his whole life. He weighed one pound when they got him. He had some issues with his lungs last month and is still recovering, but he was on the mend when we saw him, turning a corner thanks to the antibiotics. They had managed to get him to drink enough fluids without having to put him on an IV and we got to see some of his extra special TLC when we were there. At one point, while Serena and Mari were in the enclosure with him, he started to urinate and they excitedly grabbed a specimen bottle to collect it before he was finished. They were positively giddy. You know you love your bear when his peeing makes your day. It was a good sign for his recovery and here’s hoping Reno continues to improve. 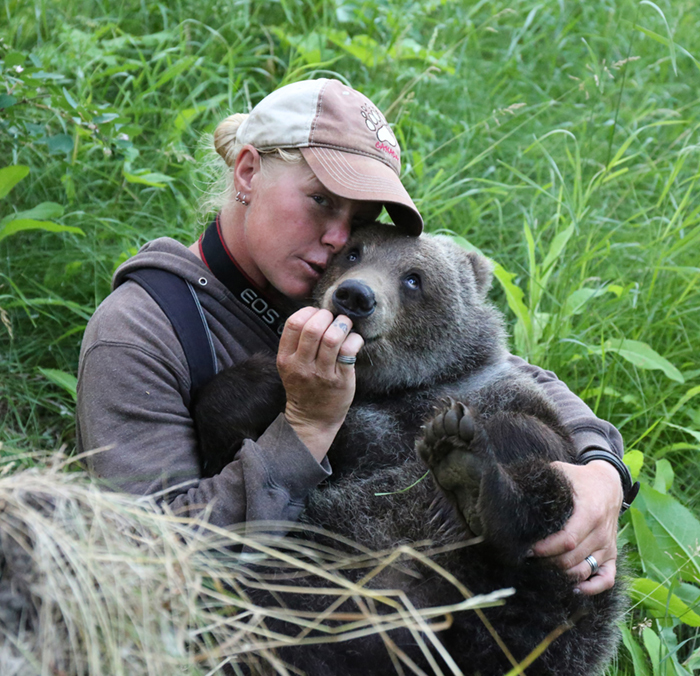 Vet bills for a bear aren’t cheap, but they do everything they can for their orphans and rescues at this place. It’s a big job, keeping all of these critters housed, fed, and healthy, both physically and mentally. I continue to be impressed with their dedication to these animals and am forever grateful they’ve allowed me to be a part of it. From sketch paintings to finished prints, I’ve painted most of their bears at Discovery Wildlife Park. I hope to keep doing so for many years to come. Here’s a video of our evening with Berkley last month. I suggest you watch it in HD on YouTube. 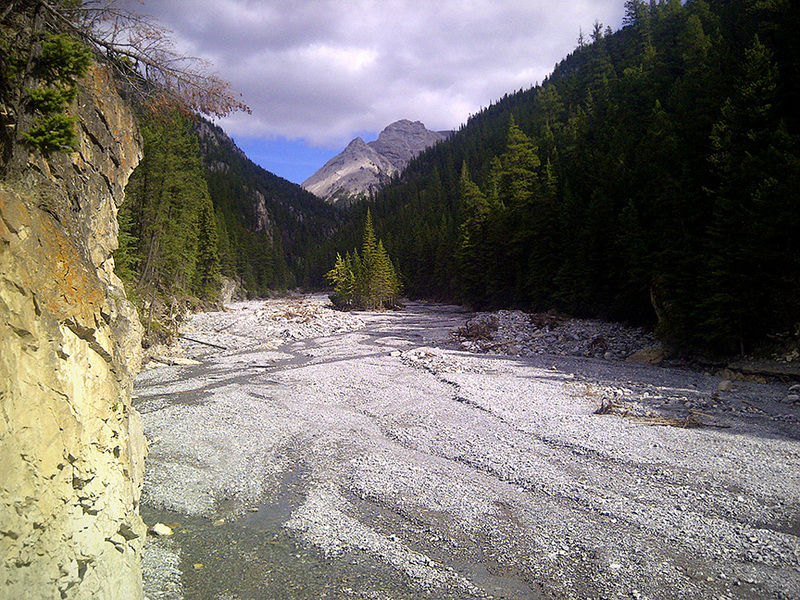 Before I became self-employed full-time, I was the admin assistant for a physical therapy office here in Canmore. For a lot of the time, it was just my boss Shane (the physiotherapist) and occasionally a massage therapist working there in the small clinic. If I recall, Shane and I are close to the same age, both into technology, and he was well aware of my eventual plans to work for myself, as my business was thriving part-time on the side. I only worked for him for a little over two years, I think, and I often tell people that it was the best last job to have. That was more than ten years ago. I left on good terms and when I run into Shane on the street once in a while, I’m always happy to see him. Because we talked about our mutual interests a fair bit when it was slow, he knew that I had been looking into 3D modeling. I had no designs on getting into it hard-core, but just enough so that I could occasionally add some 3D to my editorial cartoon work. At the time, I wasn’t painting more than the occasional caricature for a client and definitely no animals. I was still exploring my options, however, dabbling in Flash animation, trying new things to see where my career might take me. My first year working for Shane, he ended up buying me one of the earlier versions of Carrara by Daz3D as a Christmas bonus. He and I had talked about the software earlier and I remember thinking that was quite thoughtful. Instead of just a cash bonus, he bought me something I wanted but really couldn’t prioritize as a valid expense as I was still very much a struggling artist and it wasn’t cheap. Shane now has a much larger clinic in another location, with a number of physiotherapists, massage therapists and staff working for him and I’m glad his business is such a success. Both Shonna and I have gone there for physiotherapy since. I loved working with Carrara and bought a supplement for it called Hexagon, which was a basic modeller. 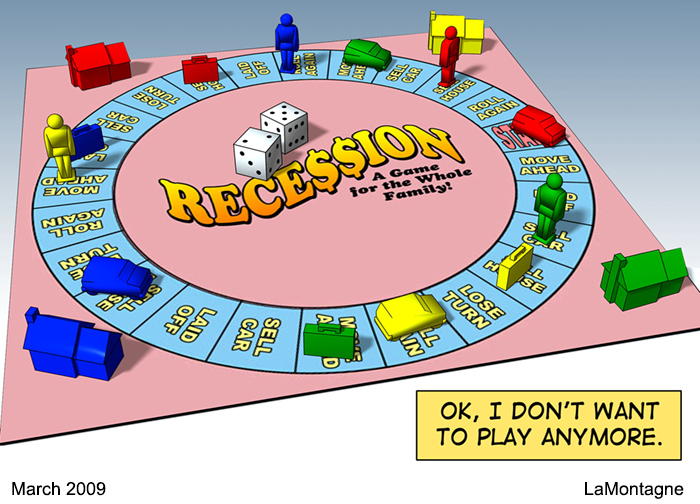 Stuff I created in those programs ended up being part of a number of editorial cartoons. Rather than search for reference or work out difficult perspective on some things, I just built basic models of what I was envisioning, brought them into Photoshop, traced over the bones and moved on from there. 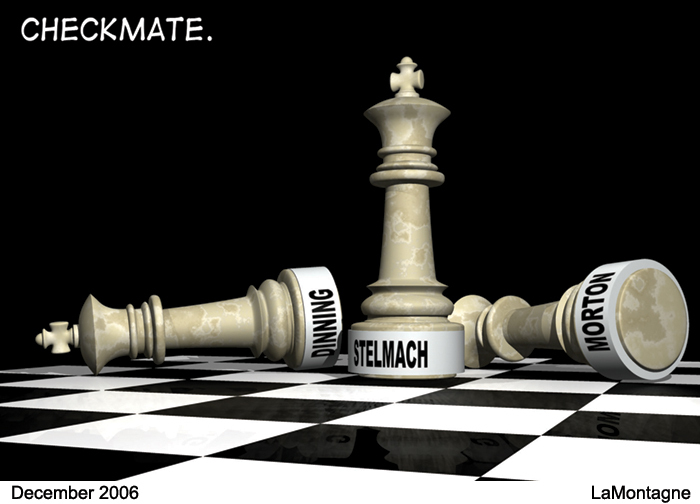 Sometimes, I just built the whole cartoon in 3D, like the chess pieces below. It was a real time saver. It also allowed me to move models around to get better angles, more interesting perspectives and revealed possibilities I might not have considered. Four of those cartoons you can see in this post, all built in 3D, with some drawing in Photoshop after the fact. A few of these were way more complicated than they needed to be, but I was also experimenting. 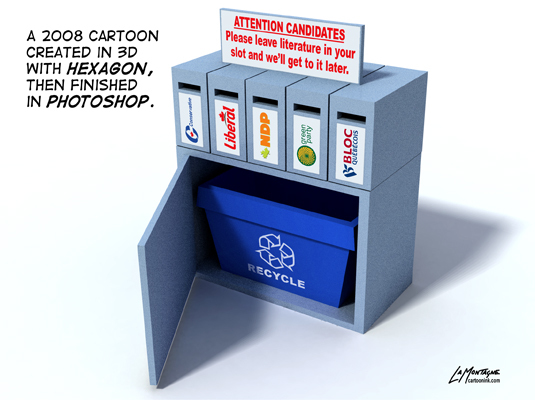 This Checkmate cartoon was for the Alberta PC Leadership race. Not knowing the outcome, I was able to create three different versions, with the names changed to reflect all three possible winners. When the result was in, I just sent out the correct one you see here. Over time, I stopped using 3D because I wasn’t interested in doing more than I was doing with it, every new release of the software involved learning new things I didn’t need, and a simple process I enjoyed became a complicated mess as they often fixed software that wasn’t broken. Eventually, the software wasn’t being supported anymore and I just let it go. I had also moved on to doing a lot of painting and the animal work that is now such a big part of my life. That’s been popping up in my head more often the last couple of years. I’ve also thought that it might be fun to build some 3D caricatures of both people and animals. To be honest, it’s been some time since I’ve yearned to learn something new, even though this would actually be revisiting an old interest with new tools and a new perspective. I’ve investigated other 3D software here and there and it’s often too expensive to justify and too complicated for my needs. It would be like learning to fly a Boeing 747 when all I need is to drive to the grocery store. I have limited time to learn new things and keep up with everything else I do. I also knew that I would lose interest in it fast if I had to essentially follow stereo instructions just to create a flower pot. One of the best programs out there, however, is one called ZBrush. A lot of professionals use it in conjunction with other software and some of the results I’ve seen are incredibly impressive. But for the cost and learning curve, it looked like the same story. Too big. In recent months, however, I’ve been hearing a lot about the recently released ZBrushCore, which is a trimmed down version of ZBrush. I’ve watched a number of videos and it reminds me a great deal of Hexagon and Carrara, those early pieces of software I enjoyed so much. The difference is that it’s more sophisticated, streamlined and offers more functionality without being a complicated mess. Few artists are programmers and when it goes so far toward the tech that it no longer feels like creating, then I’m lost. After watching a number of tutorials the past couple of days, I bought ZBrushCore this morning for $200 Canadian, which I consider very affordable. I’m a little excited about this, and while the challenge will still be to make the time to learn it, use it, and have fun with it, I’m optimistic. Learning something new this winter might also be a partial antidote to my usual seasonal doldrums. 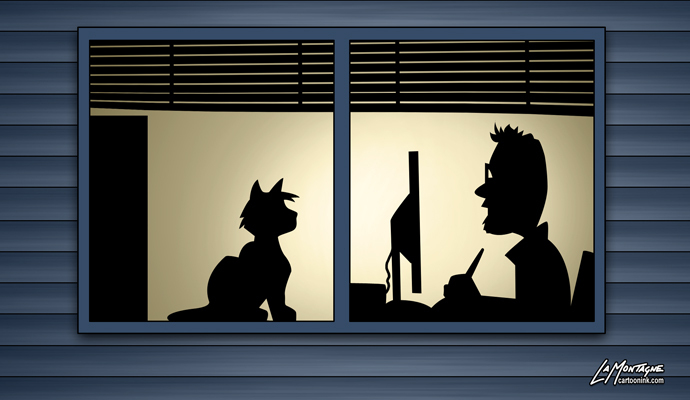 So, it’s likely I’ll be adding some 3D elements to my editorial cartoons in the coming year, and might even try out a funny looking animal or two. If nothing else, I hope to have a little fun sculpting. My animal Totems started as an experiment, painting a funny looking grizzly bear. Who knows where this might lead? For adults only, a limit of five spots, I booked quickly and was confirmed for the date seven months later. I have been looking forward to it ever since. 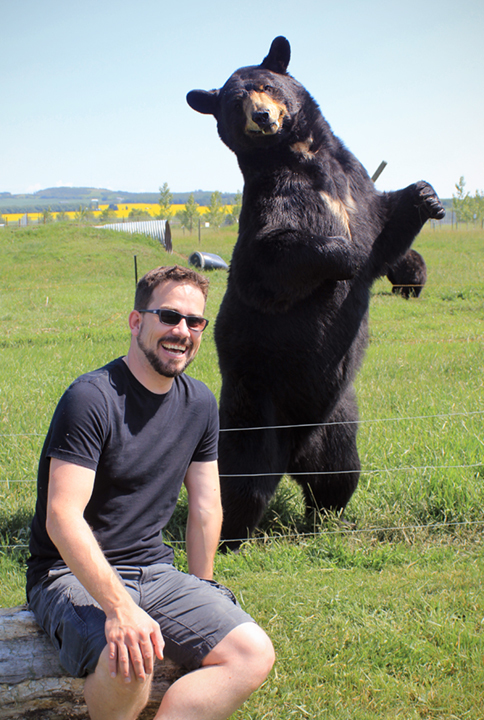 As of last year, I’ve become a regular visitor to Discovery Wildlife Park in Innisfail, Alberta. I did the behind the scenes tour with the lion cubs twice last year as I knew it wouldn’t be offered again once they’d grown. Having seen them again this week, I’m glad I took advantage of it as those kitties got big! 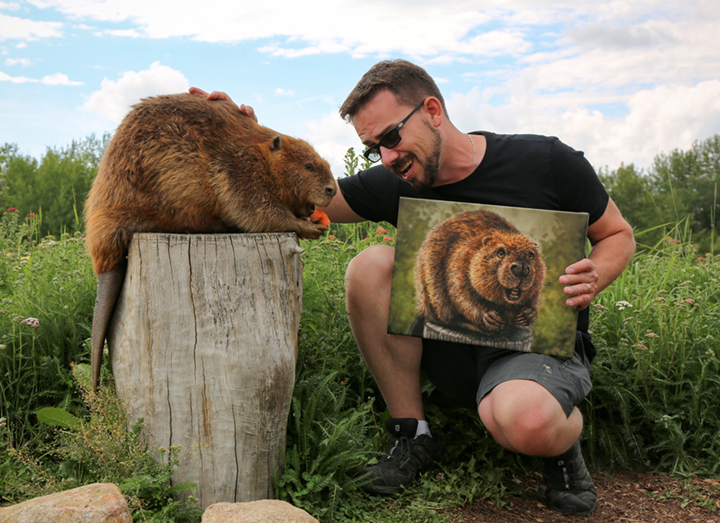 In October, I was granted a short photo shoot with GusGus the beaver and those photos resulted in my latest painting, which is already proving popular. My prints are now available in their gift shop this year as well. Incidentally, I showed GusGus his painting on Thursday. Clearly, not a fan. 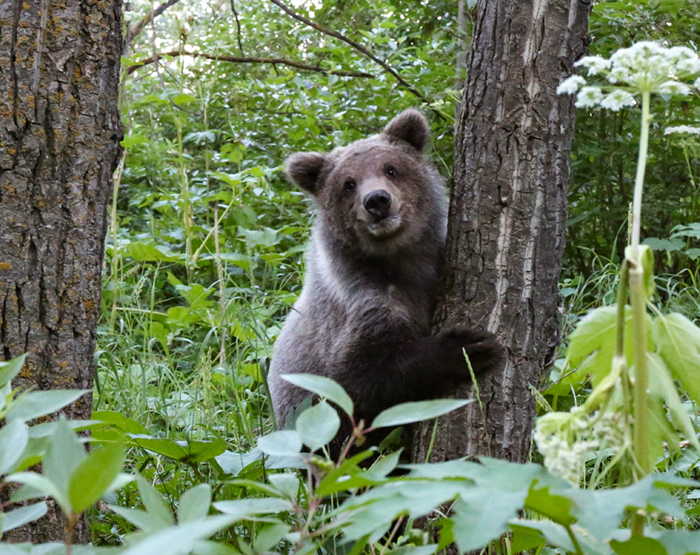 While I was sure the bear experience was going to be enjoyable and educational, I didn’t know what would be involved and was pleasantly surprised that it exceeded my expectations. 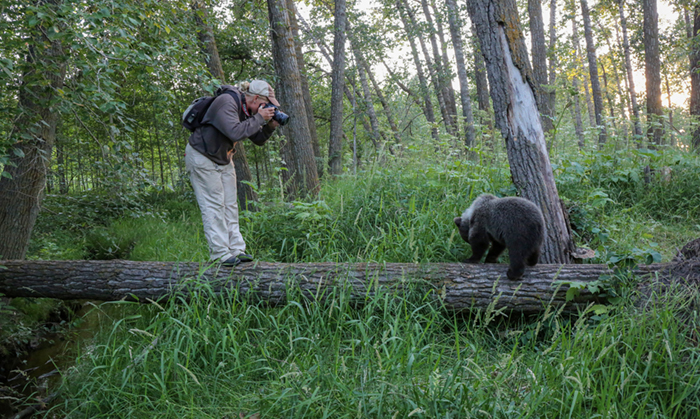 Not only did we get close access to the bears, but one of the keepers was snapping photos the whole time, so in addition to my own pics, I was given theirs as well, a nice record of the day. 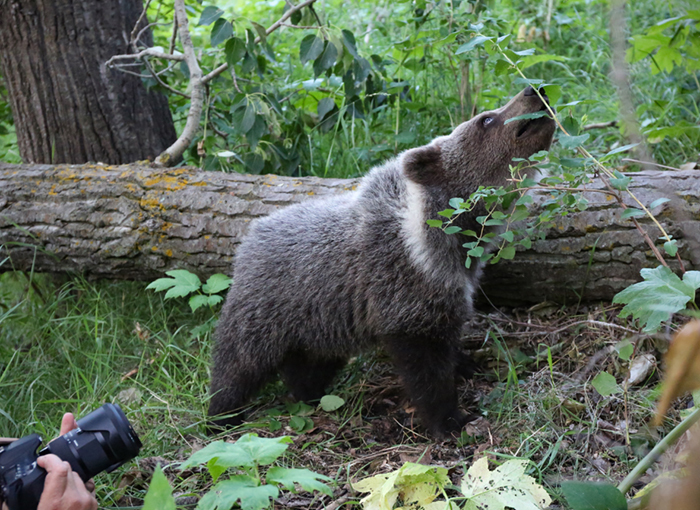 Considering some of the great things we got to do, my camera would have been in the way during those times I wanted my attention on the bears. 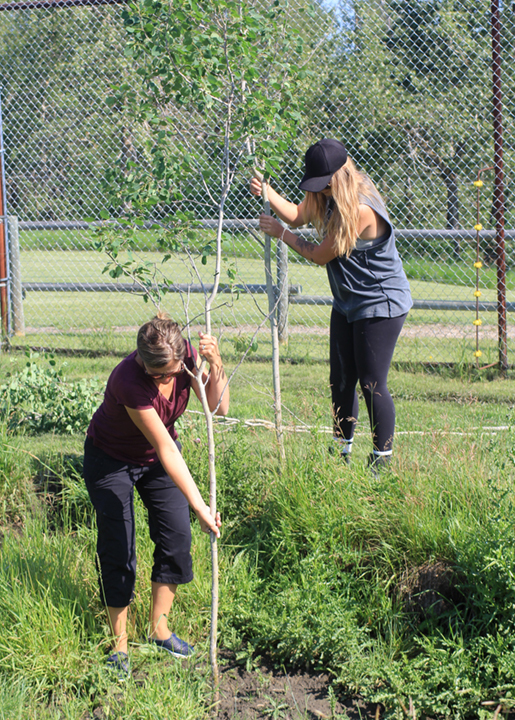 We began with raking and shoveling bear poop, something that is done every day by the keepers. 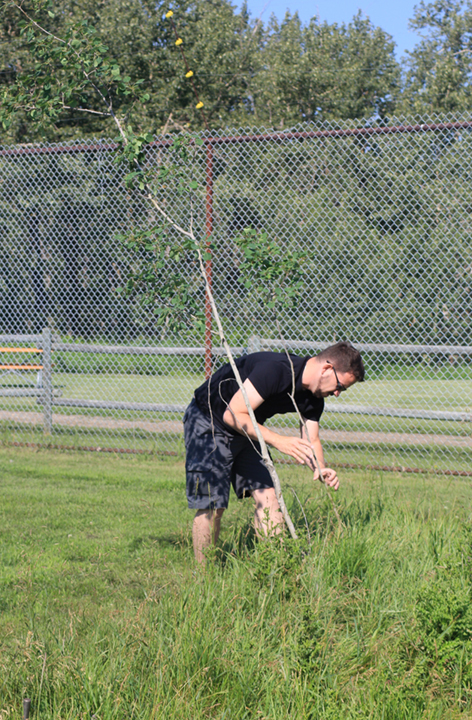 After that, we stuck fresh cut branches of varying sizes into the ground around the enclosures while the bears were ‘loaded up.’ This means they were in their adjacent pens, a substitute for a den and safe place for them, much like how your dog feels safe in his kennel. 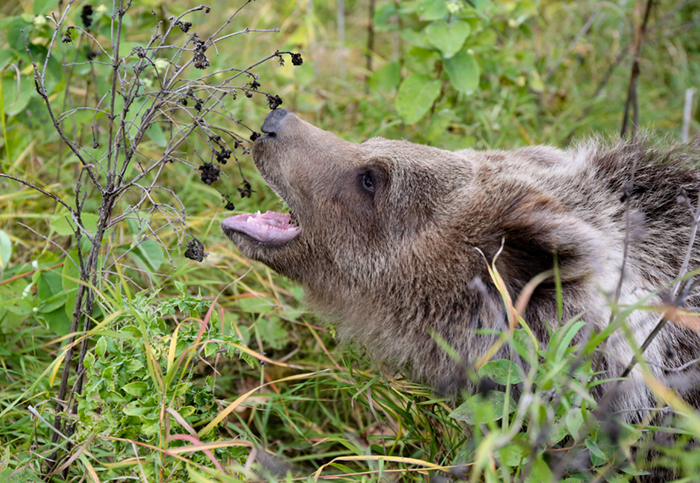 We were given peanut butter and honey that we smeared on logs, leaves and branches around the enclosure. Just a little bit, enough to pique the bears’ interest. The purpose of this exercise is enrichment. 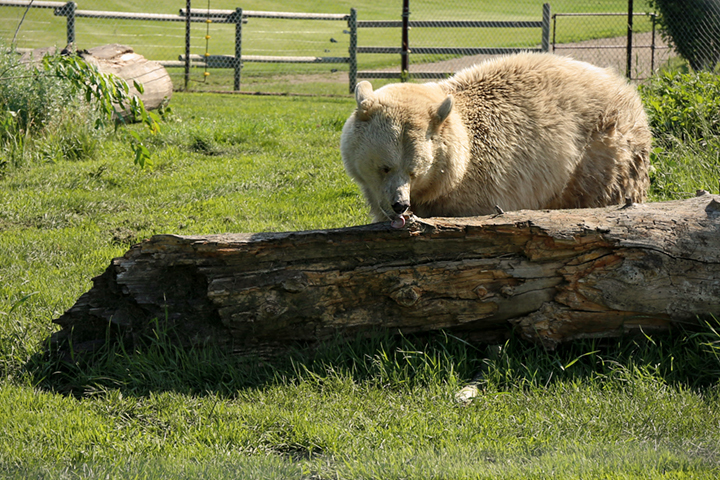 By introducing new things into the enclosures on a regular basis, it gives the bears something to do. 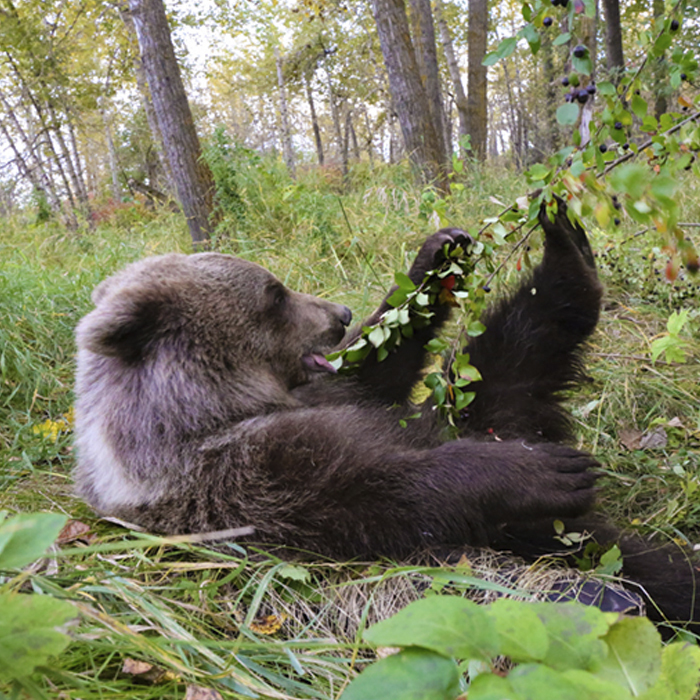 In the wild, a bear’s time is consumed with finding food. 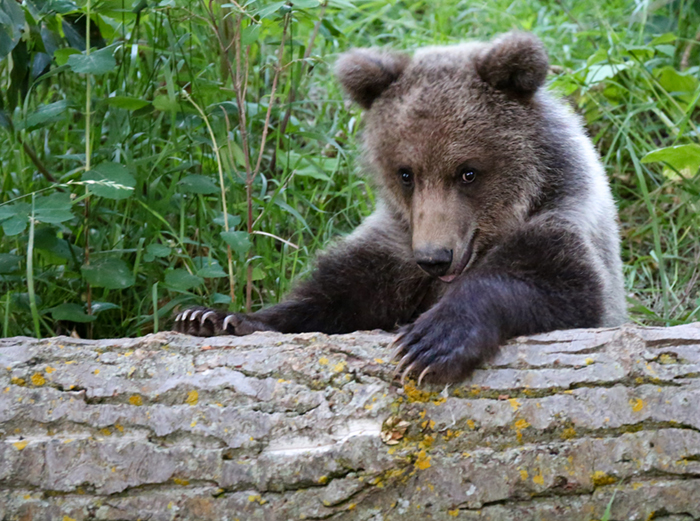 In captivity, enrichment provides them with stimulation through interesting things to explore, directly contributing to their overall mental and physical health. 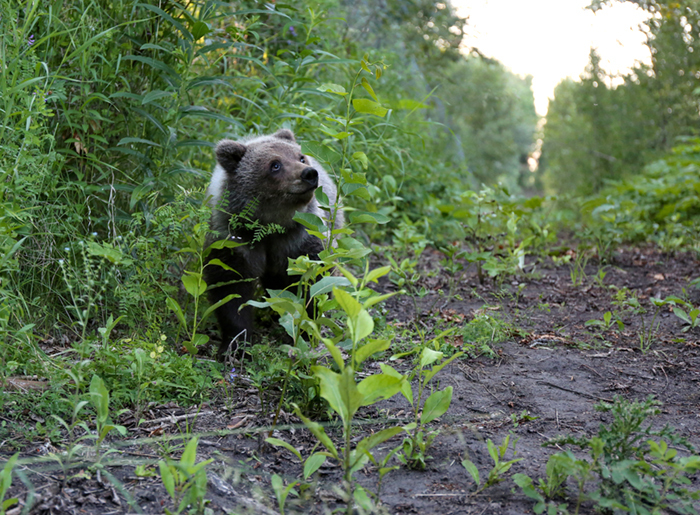 After we left the enclosure, the bears were released and we were able to see the results of our efforts. Sure enough, they were eager to check out the new digs. They manipulated the branches, sniffed out the little food smears, and were genuinely interested and engaged with what we had done. I had plenty of time to take pictures of the results. For the rest of the time, we moved from one bear to the next. A couple of them live together, others on their own. I had expected to only be exposed to them with a chain link fence between us, so I was pleasantly surprised when we were able to step inside a few times. 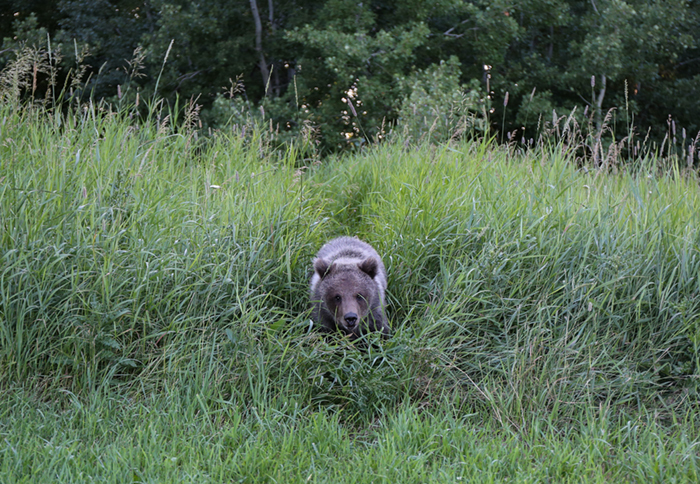 The only separation between our group and the bear was an electric fence, similar to one you’d find around a cattle pasture. 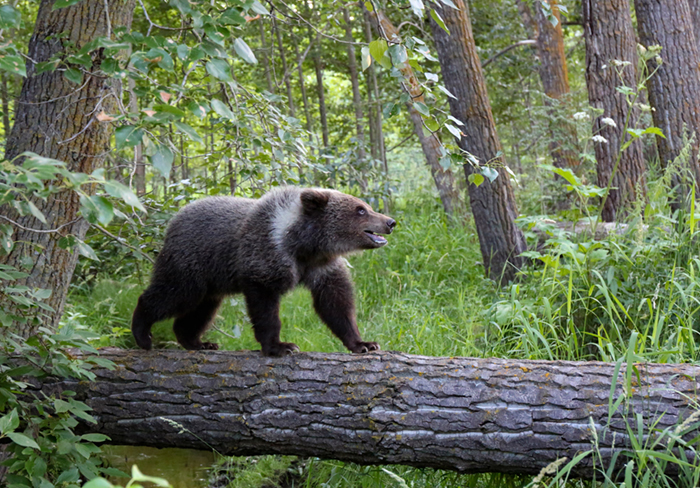 Nothing that can hurt the bear, just annoying enough to create a barrier they learn to avoid. 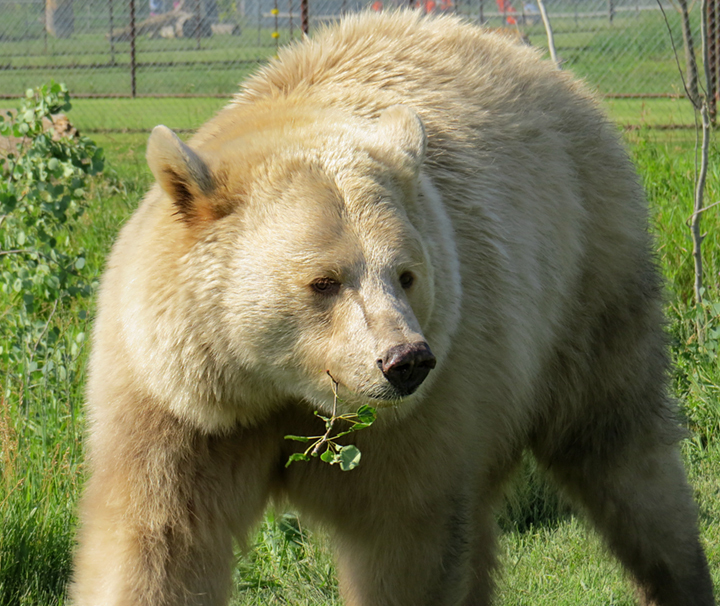 We had a chance to reinforce some of their training, spoon feed a favorite treat of avocado, and when I mentioned that a large reason for doing this was to challenge my bear phobia, the head zookeeper decided to ‘take it up a notch’ and brought out the apple pieces. The result you can see below, a wonderful experience I won’t ever forget. 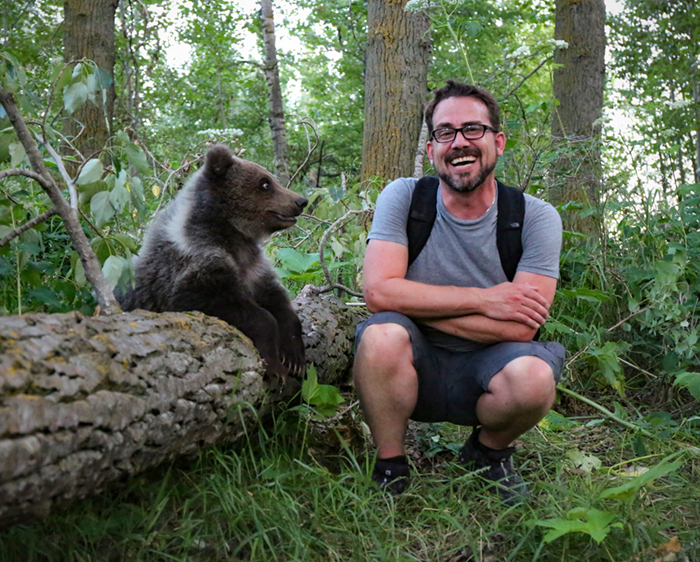 During our time with the keepers, I asked a lot of questions about captivity, the training, and the overall health of the bears living the way they do. I’ve had the back and forth arguments of conscience that many animal lovers have when it comes to wildlife in captivity. Is it cruel? Is it necessary? Would these animals be better off in the wild? Some people have asked me how I can support zoos with my artwork and accuse me of selling out at the expense of the animals. In our social media ‘judge first, ask questions later’ culture, I’m used to this and dismiss that sort of thing. It’s not worth my time to argue with people who are more interested in telling you their opinion than having an intelligent discussion. What people often fail to do is ask questions, in order to examine both sides of the argument. From what I’ve learned so far, I believe that animals in captivity, with the proper oversight and safeguards in place, offer valuable insight, especially when it comes to research, conservation and species at risk. 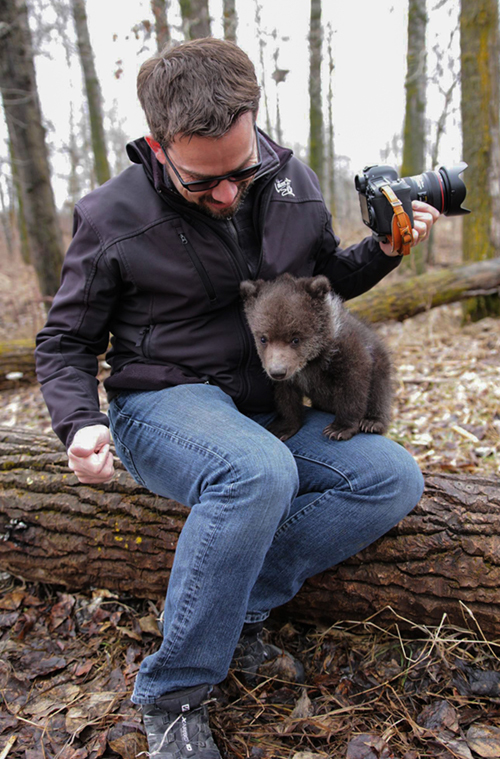 Exposure to wildlife fosters empathy, especially in children. That empathy will hopefully later translate to a greater consideration for the world around us, something of which is currently in short supply. Without going into great detail, I am personally satisfied that Discovery Wildlife Park is doing right by the animals in their care. Most are orphans or rescues and the only life they’ve known is at the park. Had they remained in the wild, they would have died. Returning them to the wild would have the same result. The life expectancy of an animal in captivity receiving top notch care and enrichment far exceeds that of one in the wild. One thing is clear to me about this facility. These animals are loved. 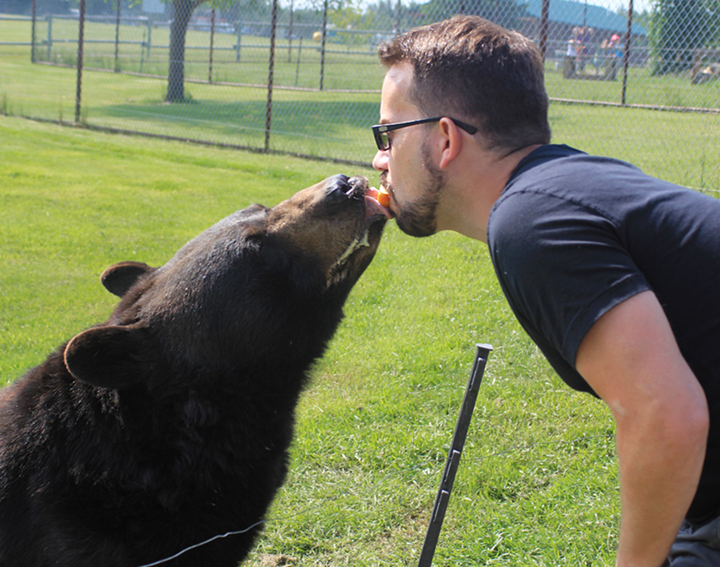 While the chain link fence separated us from the bears, the keepers were able to move about freely with them. In many cases, they’ve raised them and all of the training has been through positive reinforcement. I’d like to talk more about the reason for the training, but will save that for another post. The facilities are clean, well maintained and the enclosures are large. For some of their animals, their spaces appear smaller, but from asking questions, I found out that there’s a good reason for that. I’m a sucker for animals and when I see one hurt, injured or abused, it bothers me a great deal. I would not be able to support this park if I thought any of their practices were harming the animals that live there. I plan to return often. For some reason, I had an overwhelming urge to clear out the books that I was no longer using. I’ve currently got three bookshelves in my office. A couple of them hold novels, magazines, binders, some photo albums, and even a couple of novels I wrote years ago that I never published. Most of what I cleaned out was from those shelves. My wife cured me of any hoarding tendencies many years ago and now I hate clutter and hanging on to things I don’t need. When it comes to art books, however, it’s tough for me to let those go and all of those reside on the bookshelf right beside my desk. Sure, it was easy to recycle the Photoshop World class notes book from 2009 and a Tips and Tricks book from Photoshop CS3, but most of that bookshelf stayed. Over the years, I’ve seen other artists share insight into what sort of books they have on their shelves, so I thought I’d do the same. First of all, I like reading books and magazines on my iPad, but when it comes to art books, I still like being able to grab one off the shelf, pour a cup of coffee and spend a half hour on the couch leafing through it. It’s just not the same with an e-reader. These are the books I still reference, look through for inspiration, or just enjoy revisiting once in awhile, especially if they’re artists whose work I admire. While I’m not going to go through these book by book, I’ll tell you a little bit about them. I’ve picked these up at the Calgary Expo, bookstores, or online. Some I’ve gone looking for, others I’ve just discovered. Forgive the badly stitched first photo, but this is the top shelf. In no particular order since you can find the ones I’m talking about. Drew Struzan is easily my favorite artist and I find endless inspiration from his work. The days of illustrated movie posters are behind us now, but he was the best at it. He still does one or two when fans like Writer/Director Frank Darabont ask him to, but he’s mostly retired, now. Many of these books are instructional by cartoonists and animators I admire and still learn from. Bruce Blitz, Chris Hart, Tom Richmond, Jack Hamm, Tom Bancroft, Richard Williams. Both of Bert Monroy‘s books on Painting in Photoshop are here and those are great. Bert’s style is very photorealistic and while very different from my own work, I’ve learned a lot from him over the years, both in person at Photoshop World and online. There are a couple of books on sculpting with polymer clay, something I’ve always wanted to try but haven’t yet made the time for. A lot of great photo reference books here. 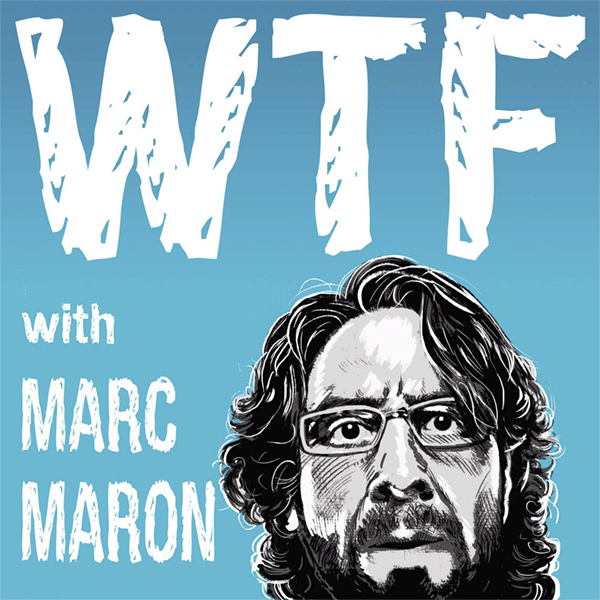 Mark Simon‘s Facial Expressions is a fantastic resource. He has one for adults, and another for Babies to Teens. I would recommend these books to any cartoonist or animator. There are a couple of Virtual Pose books, different positions of poses in print and on CD. The Artist’s Photo Reference Series, and not surprisingly, a number of photo reference books for animals. Jill Greenberg’s Bear Portraits and Monkey Portraits are two of my favorite books. She is a master photographer of posed animals and I love her work. Skin by Lee Varis is a cool book for photographers, all about lighting and retouching faces in photos. A lot of applied theory in this book directly relates to painting skin as well. 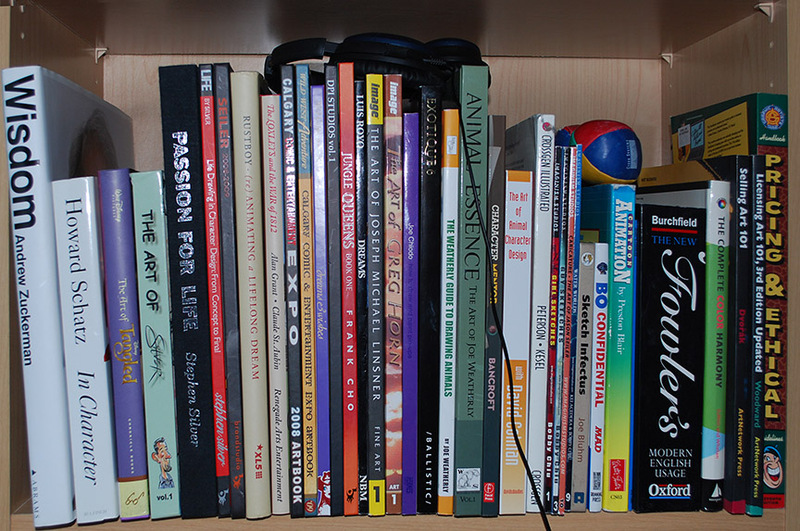 The second shelf consists mostly of books that feature the work of other artists. The first two on the left are beautiful photo books of faces. Celebrities, actors, well known people of accomplishment. While I’d never use these photos for main reference for a portrait, they’re wonderful for seeing detail in human features, skin texture, lighting. Love these books. Tangled is a favorite animated movie for the artwork. Rustboy was a one man 3D animated movie that never got finished. But the artist had some great ideas, the book is excellent, and he’s moved on to other things. Some artists represented on this shelf are Stephen Silver, Frank Cho (Liberty Meadows cracks me up! ), Greg Horn, Luis Royo, Joe Chiodo, Jason Seiler, Bobby Chiu, Joe Bluhm, J.M. Linsner, DPI Studios, Jenn Llewellyn and Tom Bancroft again. A few collections from The Calgary Expo, CrossGen Comics, Ballistic Publishing. Two favorite artists on here that specialize in animal character design are David Colman and Joe Weatherly. Their work has been a great inspiration to me. One book on this shelf, Cartoon Animation by Preston Blair is a must have for cartoonists and animators. I can’t count how many times I’ve referenced this book over the years. And finally, there are books on the right side that I keep within easy reach. Fowler’s Modern English Usage, The Complete Color Harmony, Selling Art 101, Licensing Art 101 and the Graphic Artists Guild bible; Pricing and Ethical Guidelines. While the prices in here aren’t always accurate, due to market fluctuations and the economy, there are great benchmarks for all sorts of freelance artists to base their pricing structures on. 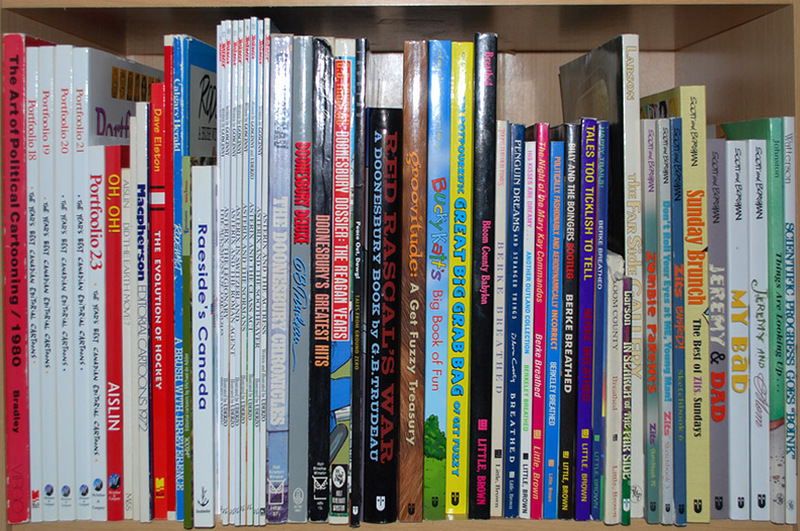 And finally on the third shelf down are the comic strip and editorial cartoonists. Collections of Canadian editorial cartoons by Aislin, Macpherson, Elston, Rodewalt, De Adder, Innes and Raeside as well as a few years of Portfoolio books. Uderzo’s Asterix books have long been favorites, I’ve always loved his artwork. Trudeau’s ‘Doonesbury’, Darby Conley’s ‘Get Fuzzy‘, Berke Breathed’s ‘Bloom County‘ (easily my favorite comic strip of all time), Larson’s ‘The Far Side,’ Scott and Borgman’s ‘Zits‘, Lynn Johnston’s ‘For Better or Worse‘ and Watterson’s ‘Calvin and Hobbes.’ On another shelf, I have four books of Frank Cho’s ‘Liberty Meadows’, which I consider a close second or third to Bloom County. So there’s a vast amount of useless information for you, a look at which books and artists rev my creative engine and inspire me to want to be a better cartoonist, illustrator and painter. There will always be artists better than you are and it’s in your best interests to seek them out and learn from them. I’ve always found that the best way to do that is to get to know their work. One of the best things about being a freelancer these days, whether it’s writing, photography, illustration or just being self-employed is that there is no shortage of information out there to help you. Just twenty years ago, there was no such thing as Google. 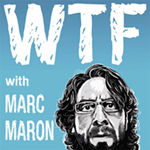 The Internet didn’t begin to gain real traction with the public until the mid to late 90’s. Before that, you had to go to the library. That’s a building with books in it. We enjoy almost instant connection today, but it used to be a lot more difficult to find information while learning a skill. If you were lucky, you might find a professional artist with whom to apprentice, but what to do if you lived in a rural area and had limited resources? Now, we have access to apps, books, trade magazines, DVDs, online courses, webinars, forums, and websites full of information, all from the comfort of our own homes. The problem with access to all of that information is that it is far too much for any one person to take in. You may have the resources to learn all you want to, but so do your competitors, so there’s no room for complacency. Thirty years ago, for example, a newspaper would have an editorial cartoonist on staff and that’s how they’d make their living, drawing one cartoon a day (sometimes less) for that one publication, spending the whole day working on one image, and not having to worry about sales, marketing, printing, promotion or local, national, and international competition, certainly not to the extent one must do so, today. Most daily newspapers have dismissed their cartoonists and are opting for more regional, national and international syndicated cartoons and paying significantly less than they used to. We are all familiar with this trend in every industry, so lamenting the fact is a useless exercise. Adaptation is the order of the day in every profession. With all of that information available and so many options, it can be easy to become anxious about where to put your efforts. Ask ten freelancers which sites, organizations, and advice you should follow, and you’ll get an infinite number of answers. If you dig a little deeper, you’ll discover that each of those ten freelancers is following the advice of ten other people, and everybody is just winging it, hoping to get enough work to pay the mortgage. Put simply, you have to try new things and then evaluate their worth on your own. Then you have to consider that something that worked for you yesterday might not work for you tomorrow. Your own instinct will be your best guide. For example, I’ve been a member of the National Association of Photoshop Professionals since September of 2004. That’s quite a long time these days. In addition to all I’ve learned about Photoshop, I’ve made invaluable contacts in the industry, and have formed lasting relationships with many people, a number of whom I consider good friends. The investment in that membership has been very good for my career. In recent years my skills have reached a point where I’m now in need of more advanced training and when the air gets a little thin, it’s tough to find that in any organization that must cater to a wide variety of skill levels. That, coupled with the fact that today, NAPP’s focus is almost exclusively on photography, it has become obvious that there isn’t much left there for me anymore. The answer was an easy No. It isn’t that NAPP doesn’t have value for photographers, because it clearly does. But I’m not a photographer. While I had a good run and it was time and money well spent, I’m looking for other learning opportunities. That being said, there’s still a good chance I’ll return to Photoshop World in Las Vegas next year. Connecting with others, networking and spending time with other industry professionals is invaluable, not to mention that I always have a good time. 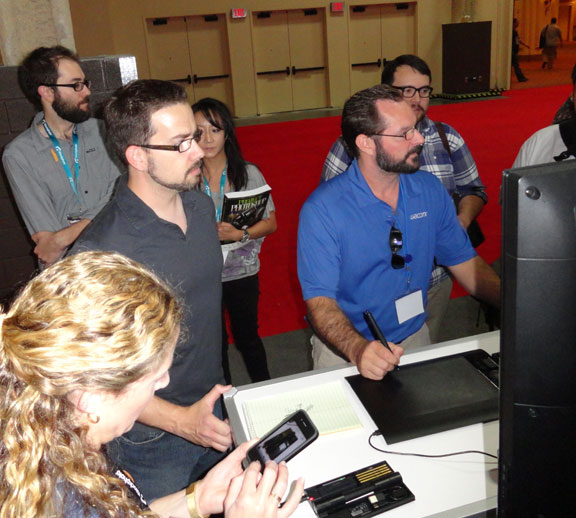 My experience teaching at the Wacom booth in September was great and I hope to repeat it again next year. But I’ll be there on the periphery, not as an attendee. So the message here is that continuing education as a freelancer is crucial to developing and maintaining a thriving career, but it’s up to you to find your own teachers, a task that will never end. You must constantly adapt to an environment that is changing so much faster than most can keep up with. When something is working for you, get as much from it as you can. When it stops contributing to your momentum and success, you need to cut it loose. For now, my own path to continued education is uncertain, but I’ll keep looking to online courses, webinars, trade magazines and I’ll follow the art of other creatives, those who inspire me to be a better artist. They say when the student is ready, the teacher shows up, so I’m not worried. While I’m waiting, I’ll just keep working. Practice makes perfect and even though I’ll never get there, I’m still aiming for it. While Adobe Photoshop can easily be called the most versatile imaging toolbox on the market, it is a monster piece of software and monsters are often frightening. With so many features and often multiple methods of accomplishing similar tasks, it can be very intimidating for even the most experienced user. Because of that, there is an abundance of training resources on the market, from large phone book manuals that try to tell you everything to books that dissect specific features in the software. Trying to learn everything there is to know about Photoshop is an exercise in futility. True there are a number of experts out there who know a lot more than the average person, but even the most educated and skilled of those professionals will agree that there is always something more to learn. Even though my use of Photoshop is limited to what I do, which has very little to do with photos, I’m constantly looking for new ways to improve my painting skills and to streamline how I work. Speed and efficiency applies to art as much as it does to technical operations, especially when you venture into the land of commercial art and deadlines. I don’t recall when I started using blend modes in Photoshop, but I can’t remember a time when I wasn’t, so it has been awhile. There isn’t a painting, editorial cartoon, or illustration that I do these days that hasn’t been touched by at least one blend mode during the process. The four blend modes I use most in my work are Soft Light, Multiply, Screen, and Color. In fact, I even have Actions set up in my Wacom Tablet Radial Menu for them. If your eyes are starting to glaze over, don’t worry about it. 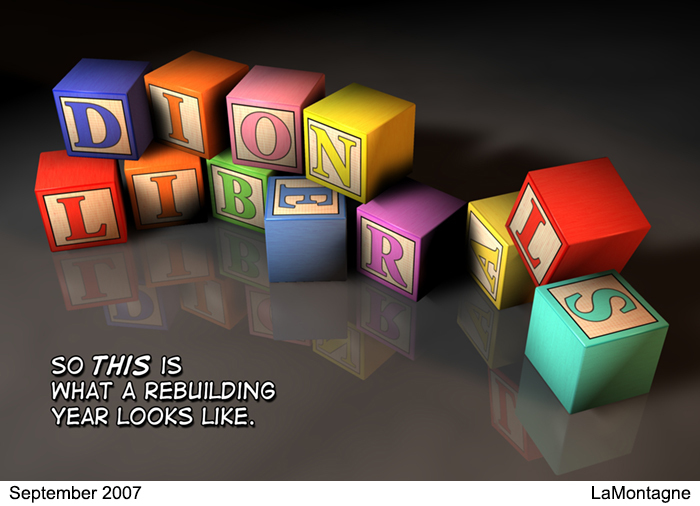 This happens to a lot of people when you start breaking down the building blocks of images in Photoshop. The thing about blend modes is that the more you dig into them, the more uses you find for them. Scott Valentine’s new book, “The Hidden Power of Blend Modes in Adobe Photoshop,” from Adobe Press, has answered a need that a lot of people likely didn’t realize they had. With Photoshop evolving every 18 months or so, anybody who uses it has to keep learning and the information in Scott’s book is as current as you’re going to find. But even if you don’t have the latest version of Photoshop (CS6), you’ll be able to apply the knowledge to previous versions, as blend modes have been around for awhile. So what are blend modes? It’s funny, but if you’d asked me that question before I read Scott’s book, you’d have been met with a long pause. The truth is, I had a good idea of what blend modes are, I knew what they did and how to use them for my own work, but I really wouldn’t have given you an answer that would have left you satisfied. Today, my answer would be this book. Without going through chapter by chapter, I’ll simply say that Scott has done an excellent job of breaking down what blend modes are and how to use them. 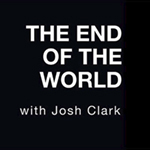 He gives very technical information for those who want it, but he also offers explanations for those who don’t. No matter how you use Photoshop, you’ll find a reason to try blend modes, but without real world examples from different disciplines, it would be easy to get lost in the information and you might fail to see the practical uses. In this book, Scott has assembled Photoshop professionals from a number of digital creative mediums to show how they use blend modes in their own work. In other training materials I’ve seen, you usually only get one professional’s perspective, opinion and methods. While there is value in that, it’s great to see how many ways others use blend modes, because one artist may offer a technique that is of no use to you, but the next one could reveal the buried treasure you’ve been looking for. In the interest of full disclosure, my own blend mode techniques are featured in this book. I was happy to offer some of my tips for using blend modes in cartooning, painting and illustration, but even without my small contribution, I would have still bought this book. I’ve been through it a couple of times and I’ve no doubt I’ll continue to reference it, because I learned a lot about a feature I already thought I knew. Turns out I had just scratched the surface. What this book does very well is reveal possibilities. Rather than give you a step-by-step for one procedure or just give you tips and tricks, “The Hidden Power of Blend Modes in Adobe Photoshop” shows you solutions that can be applied to a number of problems, even if you don’t know what those are yet. I’m not exaggerating when I say I’d be very disappointed if I was no longer able to use blend modes in my work. It would take longer to do my work and painting light and shadow (which is what I primarily use them for) would feel less dynamic and more difficult. I’m certain there are more uses for blend modes in my own work than I am currently using and I will be looking to this book to help me find them. The tools for art and creativity are like anything else. When you first begin to use them, you may feel awkward and it’ll take some time before you develop any finesse in your methods. When it comes to developing that skill with Photoshop, I’d recommend giving blend modes a closer look. Scott’s book is the best resource I’ve seen to help you do that. To find out more and to purchase the book, follow this link to Adobe Press. 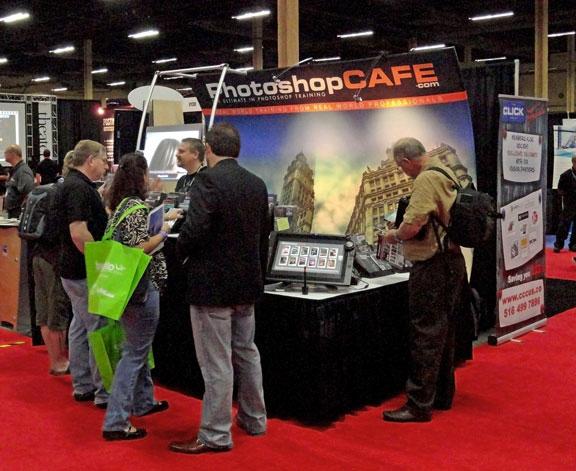 Last year, after returning from Photoshop World in Las Vegas, I wrote a blog entry about the experience and expressed some disappointment about the shortage of learning opportunities for me personally. I also said that it was unlikely that I’d be returning in 2012. The passage of time lends perspective, however, and I’m pleased to say that I will once again be heading back to Mandalay Bay in September. Why the change of heart? Simply put, I’ve adjusted my expectations and have realized that for the most part, Photoshop World hasn’t changed over the years so much that I have. While I stand by my assessment that there isn’t nearly enough of a focus on design and illustration, I also know that complaining about it on a soapbox isn’t likely to change that. I sent an email to the powers that be last year about that part of it, it was well received and I’m confident that the views I expressed were weighed and considered. I’m content to leave it at that. This year, weighing the event solely on what it is instead of what I’d like it to be, I believe it still has a lot to offer to me. As far as the classes go, I won’t even have close to a full schedule, but there are a number of them that I want to take this year, especially regarding the new features in Photoshop CS6. With the new schedule recently revealed on the website, I’ve had an opportunity to go through and see what will interest me most. One obvious choice is Corey Barker‘s 3D classes. The Photoshop CS6 Extended 3D features are apparently greatly improved, and judging by his recent work and positive things he’s said, I’m anxious to learn a little of how he’s accomplishing some of his very impressive imagery. 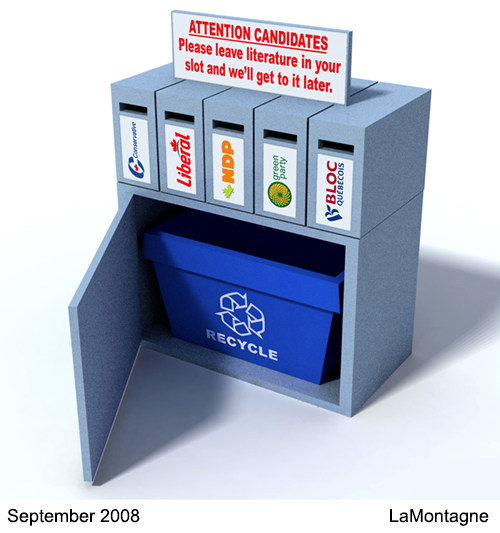 While I have no desire to become a 3D artist, I do plan to incorporate some 3D elements into editorial cartoons on a regular basis. Having done so in the past, it can be a real time saver, which is important when faced with tight deadlines. There are some social media and business classes I’d like to audit for any new information, and a surprising number of photography classes that will no doubt benefit my painted work. Classes on portraiture, lighting and composition all have the potential to teach me how to improve my paintings, as the goal for both photography and illustration is to end up with a stunning final image. Something I’ve been realizing this past year is that there is a lot I can learn from simply being at this event. Over the years, I’ve met some incredibly talented and knowledgeable people, leaders in their own respective fields and niches, and many of them aren’t even teaching at the event, but they’re still there. 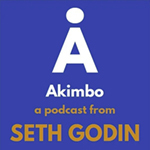 Simply being connected to these people and talking with them candidly has great value. Over the past year, I have been fortunate to work with the great folks at Wacom on webinars and other projects, have worked on illustration commissions for renowned wildlife photographer Moose Peterson and Photoshop Instructor Dave Cross, have written for Photoshop User magazine and have contributed to two books written by colleagues. I have realized significant exposure and growth of my painted work and have taken advantage of other opportunities I can’t yet discuss. Much of this has been a result of my time spent, and the people I’ve met, at Photoshop World. If you’ve been following my work for awhile, you’re well aware of the two Guru Awards I won in 2010. Although arguably insular in scope, those wins opened a number of doors for me, and I do believe that without them, I might not be as far advanced in my career as I am today. As an aside, and because a number of people have asked me, I won’t be entering the Guru Awards again. Were I fortunate to enough to win, the experience would clearly pale in comparison to that first year. I’d rather see somebody else realize their own opportunities. Furthering the relationships I’ve built with experts and practitioners in the many niches of this media industry is alone worth my time. While many of these connections are genuine friendships, it’s also just good business. Networking is a buzzword that’s thrown around by many without real understanding of what it means. Simply put, it’s forging bonds and connections with other professionals and building relationships that have the potential to be mutually beneficial to everyone involved. 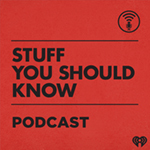 While these connections can be made online, it isn’t the same as sitting down with somebody over lunch or sharing a drink exchanging information. I can point to two very specific chats I had last year, revealing very valuable information that ended up directly impacting my career. Both of them were completely casual run-ins in the halls with acquaintances between classes. This year, I plan to spend some more time with the folks at Wacom and it’s the one time of year I actually get to chat with Colin Smith at PhotoshopCAFE in person. Considering he publishes my DVDs, probably important to talk face to face once in awhile. 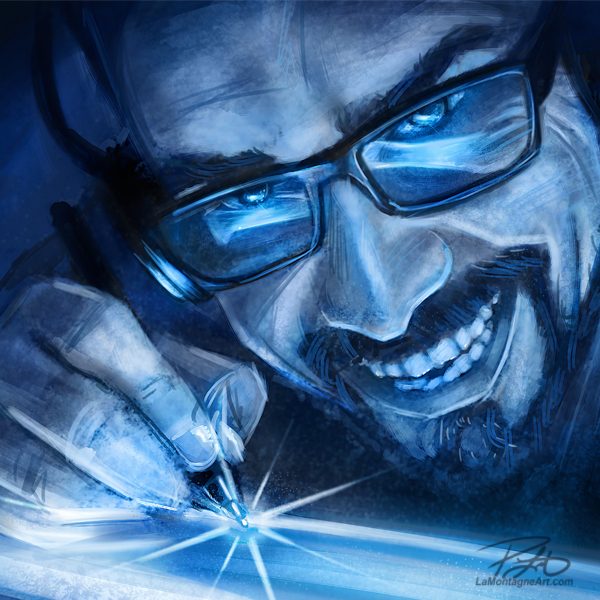 Since I’ve painted him, but haven’t yet met him, I plan to finally talk with Russell Brown from Adobe, and catch up with a number of others that I talk to online regularly but only get to see once a year. Freelancing and working from home is a great life and I wouldn’t change it. But it’s often a lonely day-to-day when the majority of your communication is done through email and social media. Connecting with other industry professionals who deal with the same challenges I do, whether it has to do with software, technique, or business has become very important to me and I’ve realized that Photoshop World provides the right venue for me to do that well. I also find that each year I come home inspired and motivated to do my best work, a byproduct from simply being around other creatives who enjoy what they’re doing. That kind of energy is contagious and that battery can always use a recharge. 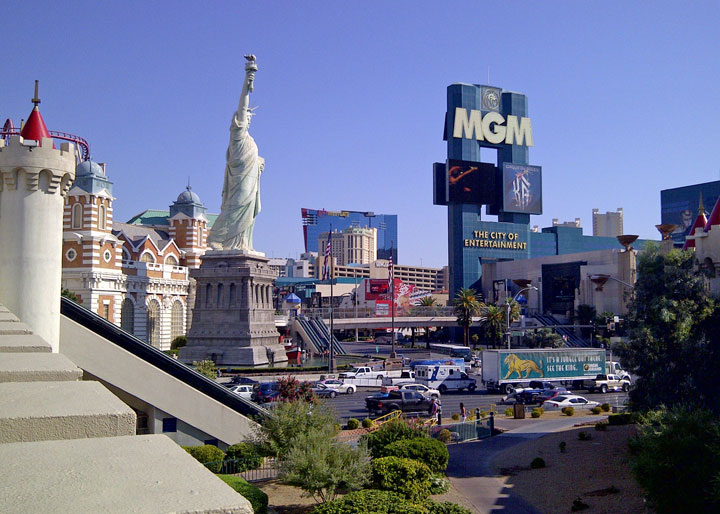 All that aside, I really like Vegas and it’s a good excuse to get out of the office for a week.